As the dust settles in July, 2015, you gaze deep in to the ragged, rocky ruins that were once your home, anticipating the arrival of the next tale of space drama from DC Comics. And lo, do your eyes deceive you? Is that Jeff Parker staggering out of the darkness? But he's not alone. Behind him are . . . could it be Travel Foreman and Jeromy Cox? No, maybe it's an extradimensional horde transcending the walls of reality that keep us safe? No, no. You were right the first time. It's the new creative team for JLU. To QUOTE Albert Einstein: “Reality is merely an illusion, albeit a very persistent one”. It seems like months since we last saw our intrepid band of intergalactic heroes. They had just defeated Byth and parted ways with their abundant fans from the future. In the intervening time, something happened. Specifically, Convergence happened -- JLU may be the only Earth-0 series where Convergence happened in the same place in the story's chronology as it did in the publishing sequence. After Convergence, Green Arrow, Martian Manhunter, and Supergirl quit the team without notice. (We omniscient readers know that the reason is to focus character development on their solo series, so perhaps we can forgive the fact that we'll likely not get a good in-story explanation as to their departure.) And now we've got a big mystery in the series; what ever happened to Adam Strange? These team departures leave our four blue-clad heroes as the core members of the JLU in its new structure. The team is now apparently an official branch of the Justice League, guided by the disembodied consciousness of their Zeta-Space stranded member, recruiting heroes (and borderline villains) on an as-needed basis to meet the specific challenges of each mission. And their missions? To trace and neutralize “breakers” around the world (and universe?) before these anomalies that “fracture physics itself” can destroy all of time and space. Yup. The Justice League United is not trying to save just some local citizens, or their town, or the big city, the whole nation, or even planet Earth. They are once again tasked with saving ALL. OF. REALITY. If you haven't been following this series from the start -- or have just lost track since March -- those four, blue clad heroes are Alanna Strange (Adam's gal), Buddy Baker (Animal Man), Miiyahbin Marten (Equinox), and Courtney Whitmore (Stargirl). 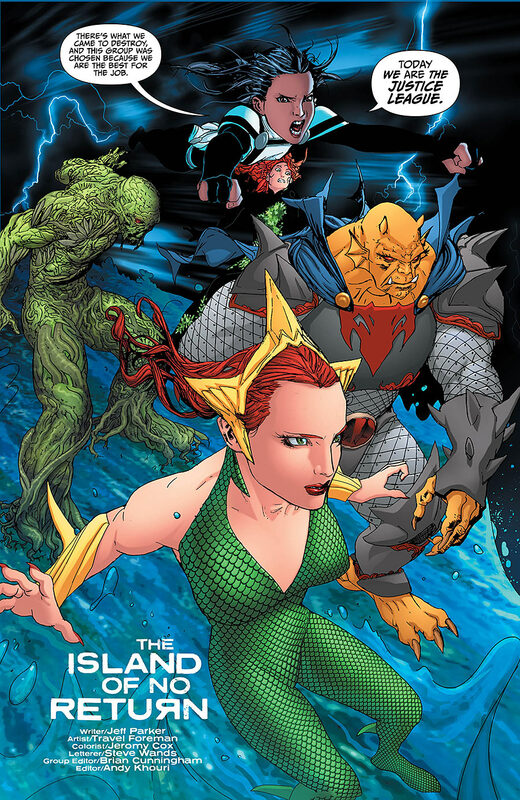 In this issue they recruit Mera (Don't call her Aquawoman), Alec Holland (Swamp Thing), Jason Blood (Etrigan), and Pamela Isley (Poison Ivy) to “fight” what appears to be a mountain of blood, bones, and wayward ships floating in the middle of Lake Erie. And not one of them made a “Lake Eerie” joke! Because saving reality is serious business! Grandiose stakes aside, if you didn't check out the Sneak Peek that came out in May, give it a spin. It gives a great introduction to this new team and story structure, via the mechanism of the core members chatting up different prospects, including the mission specialists we see in this issue. You'll get the closest thing we've gotten thus far as to an explanation of how Adam got stuck in this “unknown theoretical territory” they've designated “Zeta-Space.” It also provides a sneak peek at who we'll see in forthcoming issues, including the first look at a post-Convergence Brainiac, rocking a look that is best described as H.R. Giger meets Dark City. Though Adam's disembodied Zeta narrator voice claims that they don't know the cause of these breakers, Stargirl's conversation with Batgirl in the Sneak Peek makes reference to them being caused by the “cosmic convergence”, which, if intended as a reference to the two month event we just had, would make JLU the only Earth-0 series to acknowledge Convergence. So why the big change in pace? Apparently, Jeff Lemire has abandoned us for some awesome projects at other publishers. (Dude is keeping busy, though! Bloodshot Reborn for Valiant, creator-owned Descender over at Image, and both All-New Hawkeye and the upcoming Extraordinary X-Men for Marvel. Personally, if you're not reading Descender then you're really missing out. Space fantasy bordering on cyberpunk with Dustin Nguyen's beautiful watercolor art! Go get it.) For a guy who wasn't too happy with how he did on his first two forays in to team books, I'm going to miss him on this title. (Seriously, Jeff, aside from the Legionnaires, you did wonderfully!). But fret not, my dear readers. One Jeff gone and another appears. Jeff Parker is on the case! Parker brilliantly brought Flash Gordon, Mandrake, and The Phantom together in last year's Kings Watch over at Dynamite, and followed it up with an all-too-short ten issue run of Flash Gordon solo (sorta) title. On the DC front, he's just tapped out on his year and a half run on Aquaman and is now adjusting the path of our newly formed Justice League United. Our new artist, Travel Foreman, has a very distinct style that, frankly, may be a little off-putting at first. This style worked brilliantly in his run on Animal Man (with Jeff Lemire), and though it's a very different Buddy than we saw in prior JLU issues, he's also instantly familiar. The jury may still be out on how his style will work across the greatly varied line-ups we're going to get in this new format, but so far I'm liking what he's doing for the most part. The somewhat elongated style somehow allows him to invoke more personality and detailed emotion on character faces, particularly on the medium shots where many artists would settle for more simplified, neutral expressions. Did I mention Mera is ripped? I've only read an issue or two of Aquaman and Aquaman and The Others, so I don't know if this is her standard stature or a new take, but from what I know of her character, it fits her well. It's kind of nice to have a “heavy” on the team that's not a Kryptonian. The only character I'm not loving is Etrigan. While Foreman's take on the demon definitely looks like a demon, he just doesn't quite look like The Demon. He doesn't quite have the Kirby feel that I think Etrigan deserves. And he doesn't rhyme! He busted out a short couplet in the Sneak Peek, but here in our main story-line Parker has Etrigan speaking in prose. And he has him cracking jokes like a sassy sidekick. Doesn't quite feel like Etrigan to me. One other niggling issue for me was Alanna referring to her husband by his full name to her teammates. That's weird, right? But that's about it. The transition from Lemire's story to Parker's story feels a bit awkward, but such hand-offs almost always are. We got some token acknowledgements of the characters who've stepped away. But no mention of Hawkman, who stayed behind on Thanagar “but he said he'll be around if we need him.” Perhaps all that unpleasantness over in Bat-Mite is, in fact, canon. The rest of “what's missing” is really the mystery behind the new series direction, so not a problem at all, but rather a mystery to speculate on. What happened to Adam? Could there have been a mishap during the Strange sexytimes of issue 10? Probably not, as Adam was present and corporeal (and Alanna was not seen) in Convergence (issue 6) when Telos breached the Earth-0 universe. So some time between then and now he got stuck in Zeta Space? He can see the past and future, and the breakers we're battling threaten to destroy time and space, so is he actually allowing the team to time travel? Or is it more like precognition? From the sounds of it, only Alanna can communicate with him, which is perhaps a residual effect of their mishaps on Rann? 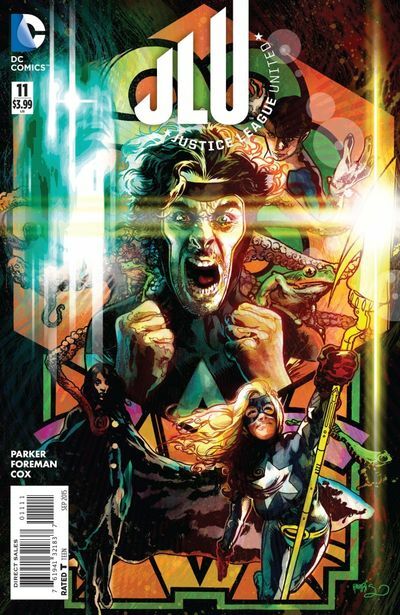 For this issue and the new structure of the Justice League United, I'm going to go with Dead Kennedys' “When Ya Get Drafted” to pay tribute to the mission operatives getting manipulated in to conscription by the disembodied mastermind. In all likelihood, nobody's profiting financially from this draft, but in the end, who do you think is going to get the credit for saving reality? Mera? Ivy? Psha. “Thank you Justice League!” And Stargirl will smile and wave for the cameras. You know that scene in Real Genius where God talks to Kent? Well, spoiler alert, Mitch talks to Kent, but, you know, as Jesus. “This is Jesus, Kent, and you've been a very naughty boy.” And all that. Yeah, so you know that scene? Well, that's our comparison for this issue. The way Alanna can hear God, but it's not really God, it's Adam, and all that. Even though she knows he's Adam. But nobody else can hear him. And he's kind of creepily omniscient. Does he know when people need to pee? Does he watch? All in all, things are looking good. We've got a great art team with a unique and engaging style that fits well with the need to differentiate an unknown theoretical territory from the rest of the world. We've got a new writer with a crazy new idea for what the series should be which sort of makes it a whole new series. We've got a structure that promises us a long line of guest star characters and character interactions we might never see in other books. We've got a mystery to be revealed over time, presumably with hints dropped along the way. And we've got Buddy Baker, the married guy, who may hold a place in the history of post-Flashpoint Earth-0 to be the first person to ever place an intergalactic phone call to a land line in southern California. While I will miss his frat-boy antics with Oliver Queen, Buddy is now the only guy on a team with three younger women: Two underage and one newlywed with a missing husband. If that next phone call to Ellen isn't comedy gold waiting to happen, I don't know what is.